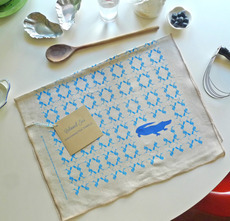 Thoughtfully made flax linen dish/hand/tea towels bring a pop of color to your kitchen routine, while doing heavy lifting to raise funding for wetland restoration. From our favorite Louisiana Company, Matter donates 10% of proceeds to impactful, innovative wetland restoration groups, like Coalition to Restore Coastal Louisiana, on a 6 month rotation. In 'Beloved Sea', the repeating blue pattern embracing an alligator was created from the shape of landmass lost in Louisiana since 1930, a consequence of coastal wetland deterioration. Likewise, the green pattern of the ‘Precious Land’ design features a pelican and is inspired from the new shape of Louisiana, after losing 20% of its landmass to wetland destruction. Work to protect Louisiana's coastal wetlands and to restore a healthy gulf are crucial both to the state and to the country as a whole. 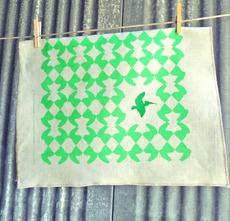 Handmade and screenprinted with eco-inks in New Orleans. The fine oatmeal linen is produced in New York state and becomes softer and more beautiful with age.